TL;DR: This page is getting a lot of views as the Win 10 deadline approaches. If you have a Dell machine, boot in safe mode or remote in via remote desktop and rename the file “C:\Program Files\Realtek\Audio\HDA\RtkNGUI64.exe”. This should allow you to boot without the blue screen. So we rolled out the Windows 10 Fall Update (1511) to a couple of PCs at the office that were running Windows 10 RTM. Every machine appeared to upgrade fine, but once any user logged into the PC, it would throw up a frowny-face blue screen stating that “Your computer experienced a problem and needs to restart”. The “if you want to know more” reference was listed as “APC_INDEX_MISMATCH”. Searching around for this points to a driver issue, though there wasn’t really an indication of what exactly it might be. The PCs could stay at the lock screen or the login screen indefinitely. The blue screen only occurred AFTER logging in. This would indicate that the issue is unlikely to be a driver, as drivers would load prior to logging in. The blue screen appeared after login regardless of network connectivity. Wire plugged in or not, right after hitting the desktop the system would crash. The implication here is that the problem is something already on the PC as opposed to something running in the network logon script. All of the machines were Dell Optiplex desktops, but several different models. Taking these items together, it would seem to point to a startup program. To test that, we could boot into safe mode (which doesn’t run startup items) and disable them. Microsoft has made it quite a bit harder to get into Safe Mode on Windows 8/10 (especially since this blue screen isn’t happening during startup, so it doesn’t trigger the repair mode automatically), but that is where we needed to turn to solve the problem. If you aren’t familiar with getting into safe mode on Windows 10 (when you can’t get to the desktop to do it through the menu, anyway), power up the machine and wait for the Windows Logo to appear and the “busy” circle to start spinning at the bottom of the screen. Hold down the power button and shut the machine off before it boots up. Repeat this process a couple of times, and instead of the spinning busy circle, the text “Starting Automatic Repair” will appear. Let this run and you will be presented with a couple of tiles on the screen. Click on the Advanced options tile, and click on Startup Options. You will be asked to reboot again. Do so, and a startup options menu will appear. Select Safe Mode (or safe mode with networking, etc). To solve this particular problem on our Dell machines, after booting into Safe Mode, open Task Manager, click on Details, and click on the Startup tab. We started by disabling all of the startup programs and rebooting into normal mode. This allowed us to log in without the blue screen. After that, it was just a matter of starting each of the startup items until we hit a blue screen. The culprit for us turned out to be “Realtek HD Audio Manager”. The executable is located at “C:\Program Files\Realtek\Audio\HDA\RtkNGUI64.exe”. Running this .exe file immediately blue screens every PC we have tried it on that has the fall update installed. I’m sure there will be an update for this eventually, but since you can’t even run updates while this error persists, it can be a real pain to get your PC back in working order. You can avoid the whole problem by disabling this startup executable prior to updating to the Windows 10 Fall Update. I recently made the jump to built 10158 of Windows 10 Mobile on my Lumia Icon phone, and one of the things it took the longest to sort out was why I wasn’t getting the same type of notifications for incoming email messages that I was on Windows Phone 8.1. I had also picked up a Microsoft Band 2 to replace my existing band, and e-mail notifications were not being pushed to it either. Digging around in W10M, I was finally able to find all of the various settings that have to be enabled to these notifications to appear (both on the lock screen, and playing notification sounds when email arrives). 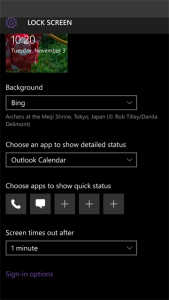 I have three email accounts loaded on my phone, and with WP8.1, I had three separate tiles on my Start screen that displayed the latest messages and new message count from each email account. I liked this, because I use my email accounts for different purposes, so having them displayed separately was helpful. Additionally, my lock screen would display new message counts for each account separately, including icons that were different enough (per account) to identify which account had new messages without unlocking the phone. When new messages arrived in one of my email accounts, WP8.1 would play a sound (customized per account) to let me know not only that an e-mail had arrived, but if it was something I should look at sooner (a message from work) or later (a message from my old ISP account that I don’t use all that often any longer). 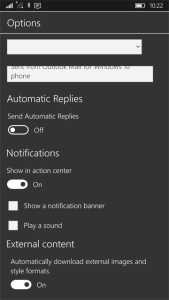 Finally, these incoming messages would be pushed out to my Microsoft Band under WP8.1, causing a buzz and a notification screen displaying a snippet of the email. After the move to W10M, all of this changed. Fortunately, after a bit of searching through the settings menus and the Outlook app, I was able to restore all of the above functionality and get Windows 10 Mobile handling my email accounts the way I like them. The first time we need to do is create separate tiles for each email account. This can be a little tricky, because (at least in the build I was using) the Pin to Start button in the logical place for it to be doesn’t work. By default on Windows 10, all email accounts are collapsed into a single application now, and you switch accounts via the “Hamburger menu” in the upper left corner of the screen. However, when viewing an email account, if you click on the ellipsis in the bottom right (…) to bring up the menu, there is a “Pin to Start” option which allows you to create a tile for just the current email account. One problem solved! 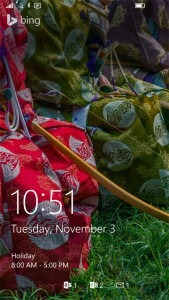 Email counts on the lock screen is next, and fortunately it is pretty easy to set up. Open the Settings app, and select Personalization. 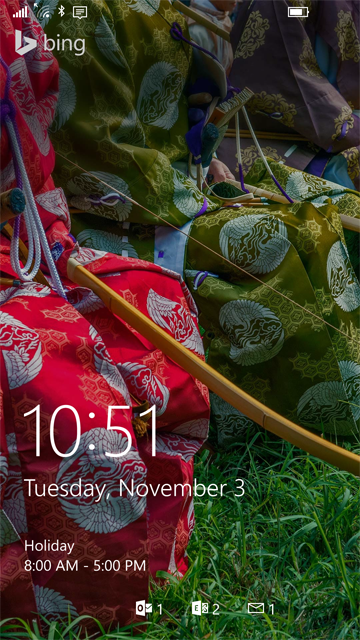 From there, select Lock Screen. Scroll down, and you should see a heading for “Choose apps to show quick status”. You probably have the phone and SMS messaging already listed here along with three boxes with plus signs (+) in them. Click on one of these, and you will be presented with a list of possible apps to display status from. 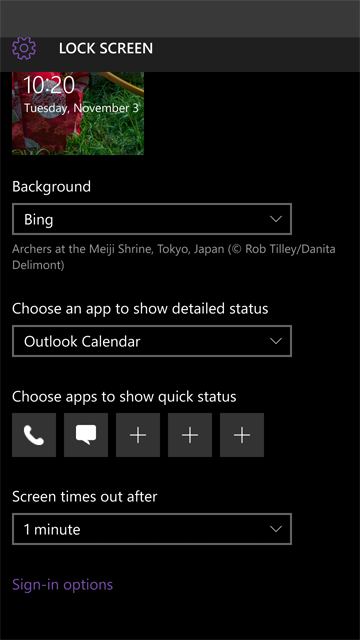 If you haven’t split your email accounts up (see Start Screen above), you can pick “Outlook Mail” here to consolidate all of your counts into a single lock screen icon. Otherwise, pick the names assigned to your individual accounts when you added them to the Outlook Mail app. In my case, I end up with three different icons (Outlook, Exchange, and a generic envelope for POP mail). Two down! To give each email account its own alert sound, head back to the settings app. Select System this time, and then “Notifications & actions”. At the bottom of this screen, you should see “Show notifications from these apps”, with a list of various apps on your phone that can provide notification messages. Find the email account you want to set a sound for and tap on it to open the notification settings for that item. From here, you can select a notification sound. It turns out that the default for the Outlook Mail app is to only send notifications to the Action Center. If you swipe down from the top of the screen, you will see your notifications, but the sounds won’t play. 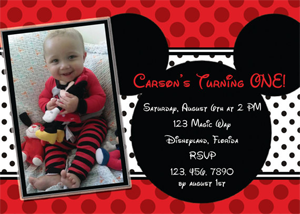 In order to fix that, go back into the email account and click on the ellipsis (…) again. This time, select Settings. Tap Options, and scroll down to the bottom of the new page. You should see a section for “Notifications”, containing a toggle switch and two check boxes. Leave the “Show in action center” toggled on, and check off the (currently unchecked) boxes for “Show a notification banner” and “play a sound”.